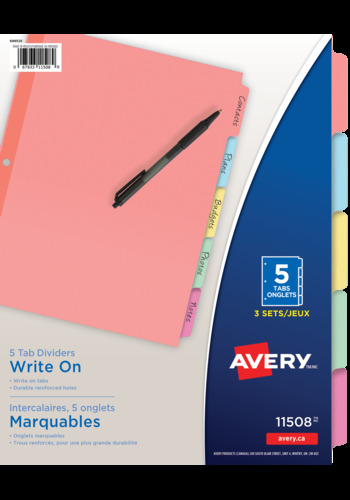 Stay on top of your documents and keep your important paperwork separated with ease using these Write-On dividers. Identify each section in a flash thanks to non-laminated tabs you can write on directly. Stay on top of your documents and keep your important paperwork separated with ease using these Write On dividers. Identify each section in a flash thanks to non-laminated tabs you can write on directly. The dividers' colours makes your writing stand out. A clear reinforced strip along the binding edge strengthens the three punched holes to resist tearing on your binder's rings. Your documents will be organized and you'll be in charge. Write-On Paper Dividers are perfect for when you want to keep up with organization quickly and immediately.